Many houses built between the late 1800s and the mid-1900s have a gravity heating system, also known as an octopus furnace. Unlike a modern furnace, a gravity system has ducts but no fan. Usually located in the basement, floor or wall, a gravity heating system allows warm air to naturally rise into a home. You may find a gravity heating system in an older home. Most gravity systems were designed to burn coal, but they will also burn propane, oil or natural gas. After the coal or other fuel enters the combustion chamber in the basement, the heated air flows upward through the ducts and into the rooms through floor vents. A gravity heating system is quiet and does not blow dust into a room because it does not have a fan. The system functions for many years because it has fewer parts and requires less maintenance than a modern furnace. A gravity system takes longer to heat a home because it lacks a fan to force the warm air into the rooms. 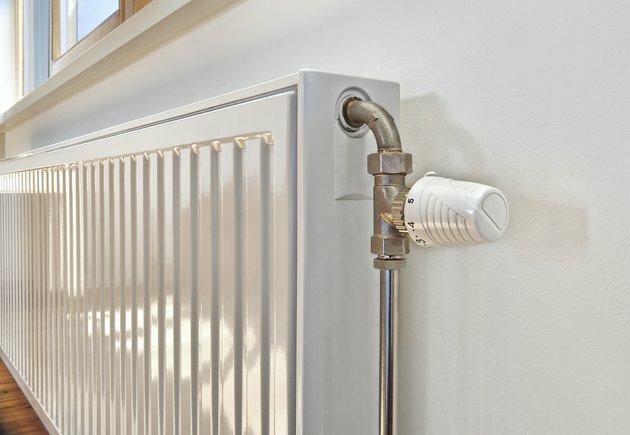 An efficient modern forced hot air system uses 95 percent of the heated air to warm a home, notes the National Association of Certified Home Inspectors. Only 50 percent of the heated air in a gravity system warms a home, while the rest of the warm air escapes through the chimney.